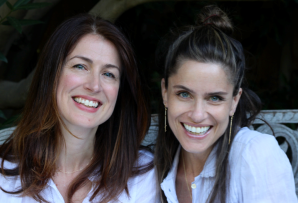 Join actress, playwright, and author Amanda Peet along with her friend and co-author Andrea Troyer for an insightful conversation about their own families and the sometimes complicated nature of identity for American Jewish kids at Christmas-time. In this new children’s book, young Rachel Rosenstein wrestles with her culture, customs, and love of sparkly Christmas ornaments, but she comes away with a brighter understanding of her own Jewish identity and of the gift of friends and family. Attention Young Friends ticket holders (ages 21-40): You are also invited to attend a meet-and-greet with the authors at 6 pm prior to the program. You must purchase tickets to the program (see links below) as well as RSVP to the reception by sending an email to youngfriends@nmajh.org. Dear Santa, Love, Rachel Rosenstein will be available for sale and signing after the program. Amanda Peet (right) is an actress and playwright. She has appeared in numerous films, including Please Give, Syriana, Igby Goes Down, and The Whole Nine Yards. Her TV credits include Studio 60 on the Sunset Strip and Togetherness. Her play The Commons of Pensacola starred Blythe Danner and Sarah Jessica Parker. She lives in Los Angeles with her husband and two daughters. Andrea Troyer grew up in Minnesota and received an MFA from the University of California, Irvine. She lives in Los Angeles with her husband and two young boys. Christine Davenier is the illustrator of many children’s books, including Julie Andrews’s The Very Fairy Princess series. She lives in Paris.